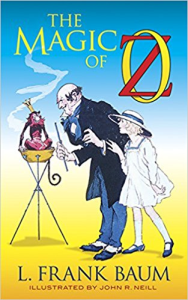 In this witty and imaginative tale, the “Royal Historian of Oz,” L. Frank Baum, takes young readers back across The Great Sandy Desert for more exciting adventures in the wondrous Land of Oz. Old friends such as Dorothy, the Wizard, and the Cowardly Lion reappear, along with endearing new characters — the Glass Cat, the Hungry Tiger, Little Trot, Cap’n Bill, the Lonesome Duck, and others. 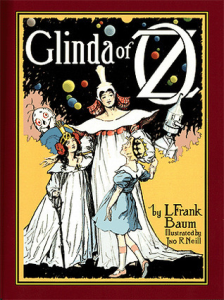 Seeking special birthday presents to express their devotion to the wise and beautiful Princess Ozma, the friends venture beyond the Emerald City and into unknown territory. Little Trot and Cap’n Bill find themselves stuck — literally! — on an enchanted island, while Dorothy and the Wizard uncover a treasonous plot. It seems that Kiki Aru, the foolish son of a magician, and Ruggedo, the evil King of the Nomes, intend to recruit an army of forest-dwelling beasts, overthrow Princess Ozma, and enslave the citizens of Oz. Can Dorothy and the Wizard foil the conspirators’ plans and rescue their stranded comrades? You’ll find out in the pages of this exciting story. 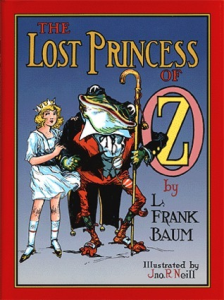 Graced by a wonderful array of original black-and-white drawings by John R. Neill, as well as 12 captivating full-color plates, this spirited tale will thrill readers of all ages.